Until Rain is a progressive metal band which was formed back in 2008 in Thessaloniki, Greece. The band’s music is a mix of many musical elements such as prog, melodic and experimental metal, art rock, electronic music sometimes combined even with extreme metal elements. In July 2009 Until Rain signed with Steel Gallery Records for their first label release, the debut concept album, “The Reign Of Dreams”. The album was recorded during the first months of 2009 in Athens, Greece. Its concept concerns dreams, but its scenario could be adapted to reality as a real and adventurous life story. Until Rain quickly followed up with the EP “Pandemic” (February of 2011), which consists of 4 new songs and 4 bonus tracks (acoustic versions, radio edits etc), giving a taste of Until Rain’s next full length release, blended with 2 tracks from the past, sounding heavier than the first album and more mature. The band toured around Greece promoting those 2 releases throughout 2011 and 2012. Later they started the recordings of their 2nd full length album “Anthem to Creation”, recorded by the band and mixed/mastered at Fascination Street Studios by Jens Bogren in Orebro, Sweden. The band has toured around Europe to promote this album along with Andromeda and performed in 15 European Cities this November & December of 2013 (London, Paris, Barcelona, Vienna & more). UNTIL RAIN’s first album since 2013’s well received “Anthem To Creation” finds the band exploring the dark world of psychological/emotional abuse, loss and doubt and it presents the darkest side of Until Rain till this day. Tempos got slower but also the soundscape got bigger and as always many many melodies and hooks will keep you head-banging and singing along to most of the songs of the album. More “to the point” songs and less fiddling around lets the new singer of the band Cons Marg (know for his work with Arjen Lucassen’s Epic Choir) shine while the rest of the band lays the foundation of some really heavy & melodic contemporary prog metal. 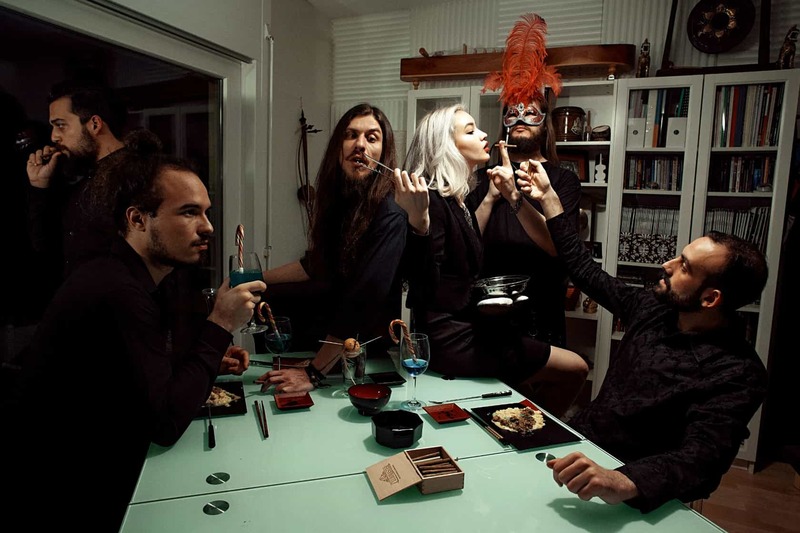 The 2 main composers/lyricists of the band Lef Germenlis & Theodore Amaxopoulos are surrounded this time by the ingenious bassist Linus Abrahamson (known for his work with Andromeda & Constancia), the Maltese workaholic wonder Matthew Vella on drums and the multitalented Swiss/Thai female singer Donna Zed on backing vocals. “Inure” was recorded by Until Rain in various European cities (Thessaloniki, London, Gothenburg and Lausanne) and mixed/mastered by Daniel Cardoso of Anathema in Lisbon, Portugal. It features artwork by a new greek artist/designer Nassia Kefala and a hand drawn cover that completely represents the concept of the album and the duality of many inured people they they look lush on the outside and they are rotten on the inside. They have also shared the stage with many artists over the years – to name a few: Psychotic Waltz, Jeff Martin (The Tea Party), Rotting Christ, Andromeda, Firewind, Wolverine, Septic Flesh & Leprous. In 2015-2016 Until Rain performed in Prog Power Europe (Netherlands) and Metal Over Malta (Malta). The band has also toured Europe April and May of 2017 visiting some cities for the first time (Berlin, Östhammar, Den Bosch, Zoetermeer, Gothenburg, Sofia, Bucharest, Belgrade, Nottingham) and revisiting London, Paris, Copenhagen and Thessaloniki. During 2018 the band focused solely in the writing & recording of their upcoming album doing only one show in Prog the Islands festival, Malta, Dec 2018.